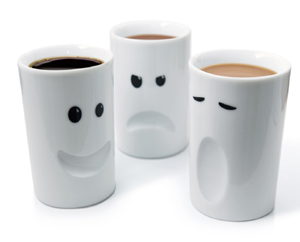 Mood Mugs are hand made insulated porcelain coffee and tea cups that have a simple facial expression to reflect your mood. Happy as Larry mug is perfect for when you wake up with a spring in your step.Seriously Sleepy Mug is for when you’re a bleary eyed, sleepy head. And Monstrously Mood Mug lets everyone know exactly how you’re feeling and to stay away. Mood mugs have a double wall insulation to ensure that your beverage keeps hot but your hands are kept cool. This eliminates the need for a handle, giving you more cupboard space. Corsage Teapot is an alluring modern tea pot. If you’re passionate about tea, its unique design will enrich your tea drinking experience and is certain to be a talking point with your guests. 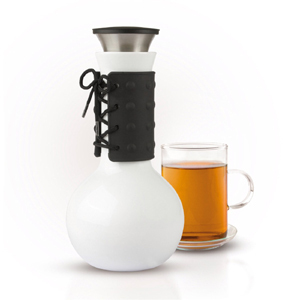 The sensuous white tea pot made of porcelain is covered by a tactile black lace-up silicone corsage at its slim carafe throat. This corset is heat resistant and can be used as a handle to prevent you burning yourself when pouring tea. The corset tea pot also features an integrated stainless steel tea infuser which allows for quick diffusion of loose leaf tea. And the stainless steel funnel-shaped pourer allows for drop free pouring. Silicone Pinch Holder is perfect for serving hot plates or taking them out of the microwave. Available in three colours, they fit over your thumb and index finger and are handy to use when you just need to carry a small hot dish and can’t be bothered to don full oven gloves. Trudeau Silicone Pinch Holders give you a secure, non-slip grip. 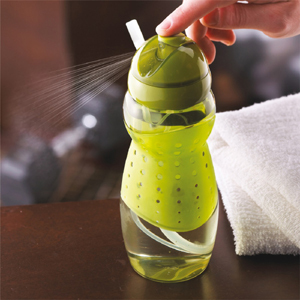 Heat resistant to 250c, they’ll ensure you never burn your fingers again and they’re also dishwasher safe. 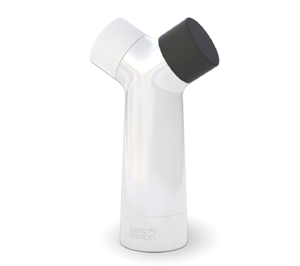 Y Grinder is a sleek Salt and Pepper Mill with a unique twin-chamber design allowing both salt and pepper to be dispensed from the same unit. The salt and pepper grinder is suitable for grinding all types of seasoning – including rock salt and can be easily adjusted to grind from course to fine grain. An innovative re-design of one of the most essential kitchen accessories, Y-Grinder has been awarded the Design Plus and Reddot Design Award 2010.